LimogesFactory.com is a collector’s paradise! They offer an impressive selection of 100% authentic Limoges Porcelain Boxes and Figurines. So you may be asking like I did what exactly are Limoges Boxes? They are collectibles that range in size between 2 inches up to 5 inches. They were first collected by French royals and nobles and are well known for their exquisite craftmanship and beautiful designs. Limoges porcelain gets its namesake from the city it is produced in- Limoges France. So you can own your a little piece of history! If you are looking for a unique and timeless gift or want to start your own collection, then LimogesFactory.com is the place to start. 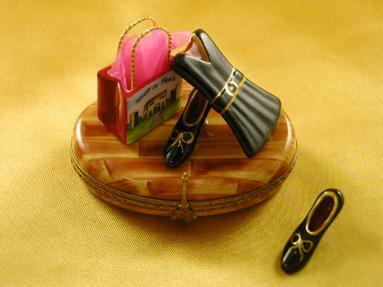 Here you can find a gorgeous array of Limoges Boxes and Limoges Figurines. I was blown away by the sheer number of collectibles. They have a category for just about everything including Fruits and Vegetables, Cats and my personal favourite, Ladies Accessories. This one is called Paris Shopping- isn’t adorable! 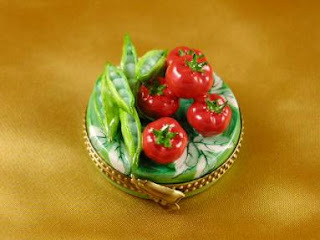 I am so wanting to start a Limoges collection now!! When you visit LimogesFactory.com you will find there is so much to see. I like the way the site is set up so that you can browse through the various categories or browse by price. This makes your purchasing decisions MUCH easier. Rest assured that your collectibles will be shipped to you carefully and quickly and LimogesFactory.com boasts a 100% record for their items arriving in perfect condition. If by chance they do get damaged on the way to you, they will replace it immediately at no cost to you. This small-family owned business takes great pride in making each customer satisfied and happy to ensure the best shopping experience possible. LimogesFactory.com is offering my readers 10% off orders over $200 with the coupon code “LimogesPromotions”. Check out LimogesFactory.com and see what I mean about how darling these boxes and figurines are! Great boxes. I read your post on How to become a product reviewer, on MBC. I will be sending you an email.